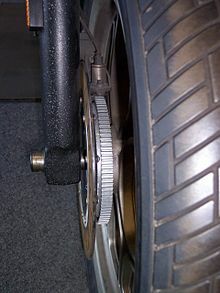 ABS is an automated system that uses the principles of threshold braking and cadence braking, techniques which were once practised by skilful drivers before ABS braking systems were widespread. ABS operates at a much faster rate and more effectively than most drivers could manage. Although ABS generally offers improved vehicle control and decreases stopping distances on dry and some slippery surfaces, on loose gravel or snow-covered surfaces ABS may significantly increase braking distance, while still improving steering control. Since ABS was introduced in production vehicles, such systems have become increasingly sophisticated and effective. 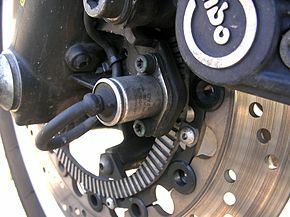 Modern versions may not only prevent wheel lock under braking, but may also alter the front-to-rear brake bias. 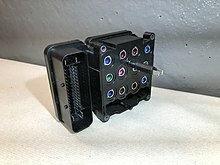 This latter function, depending on its specific capabilities and implementation, is known variously as electronic brakeforce distribution, traction control system, emergency brake assist, or electronic stability control (ESC).